This month we are excited to spotlight the launch of StemInsight.org. 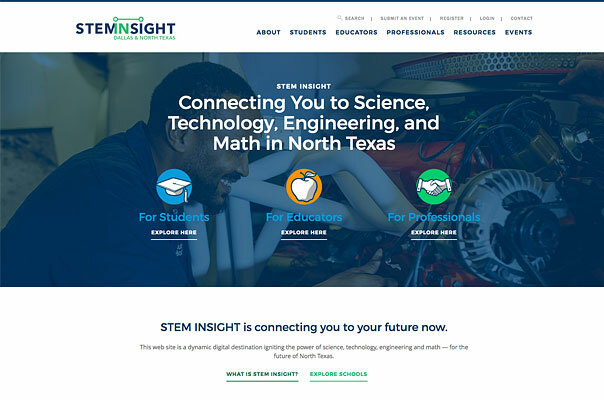 STEM Insight is a centralized collaboration portal that compiles, supports and leverages the resources across North Texas to satisfy the region’s growing demand for an abundant, skilled STEM workforce. The Old State was selected in 2016 out of a group of many candidates as a part of a three year grant to work with the Dallas County Community College District to plan, design and develop a website that attracts and provides information regarding STEM curriculum, job data and events in the region. Science, Technology, Engineering and Math initiatives are becoming more prevalent as the importance of these skills becomes more and more sought after in the workplace. This new site unifies STEM efforts across the Dallas and North Texas region by including information about STEM at additional higher education institutions across the area. It does this by enabling users to track shifts in STEM professions and salaries. By connecting to the DCCCD Labor Market Intelligence Center, users are able to access on-demand, easily readable information about STEM careers. 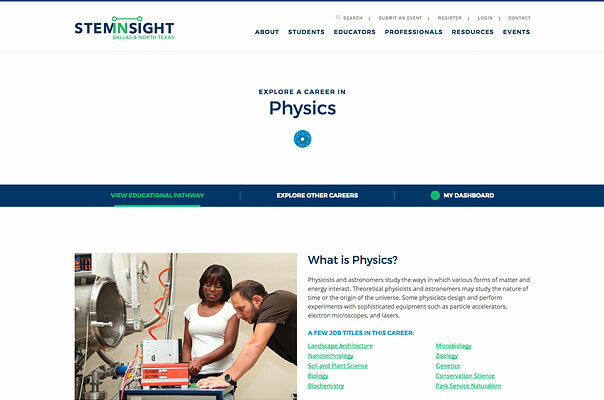 STEMINSIGHT.org also includes centralized information about professional societies, mentoring, internships, research experiences, part-time job opportunities, full time job opportunities, and extracurricular opportunities (i.e. coding camps, hackathons). Perhaps the most challenging aspect of this project was the wide range of target audiences. Middle school students and their families all the way up to college and university faculty, advisors and administrators and everything in between. We spent a lot of time figuring out ways to streamline the message and user journeys. Ultimately we created ways for users to self identify early with the UI/UX which guides them thru a tailored experience depending on who they are. The challenge was to create a clean, intuitive design with clear navigation as well as make sure all the necessary and extensive educational pathway and career data was easily accessible. We worked closely with the content team from DCCCD to ensure the content and user interface provided a way for users to quickly and efficiently access the data and save items to their custom dashboard. The results have been amazing, the site has garnered quite a bit of early attention, and we are excited to see it grow. We are working on phase 2 now and have really enjoyed working with the great team at the Dallas County Community College District. We could not do it without the trust and support from great clients like these great and talented team members that help us launch sites like StemInsight.org. We look forward to seeing this site grow and help expand STEM initiatives across the region.